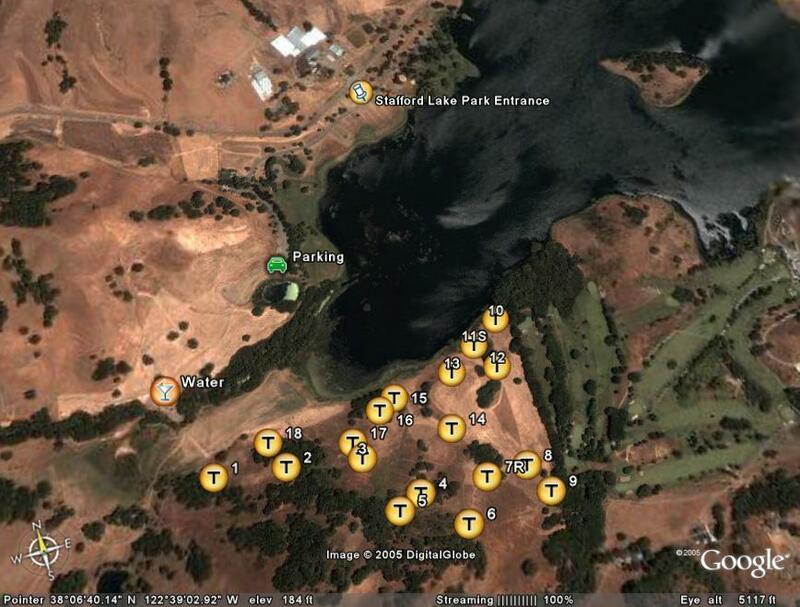 Stafford Lake is simply one of the finest Disc Golf courses in the world. There are other more difficult courses, and there may be a few as beautiful, but we know of no other courses this gorgeous and technically challenging for pros and amateurs alike. In order for the continued use and development of this golf facility we ask that everyone who visits and plays this course do so with the strongest regards for the land. We expect everyone to be a model sportsperson and spokesperson for the game of disc golf. NO DOGS ALLOWED !!!! - This is a park rule that we really like as nothing ruins a round more than having your disc land in you know what. Please be aware that there is a hefty fine for dogs in the park. Respect the wildlife. It lives here...we are just visiting. Please do not leave garbage on the course.Take out what you bring. Refrain from smoking. There is a lot of high grass. If you do smoke, please take your butts out with you. Thank you. Use spotters when you are unable to see the target. Your game will move faster with less lost discs. Beware of the park's closing hours. You must be out on time or you will be locked in the park. Take walking time into consideration when planning your departure from the course. There are currently no restrooms or water on the course. Bring water. At hole #9 we run along side a golf hole on the adjacent course. Please be courteous during play. The Course at Stafford Lake is a bit rugged, so be prepared for a good hike. The first 5 holes are pretty difficult relative to the rest of the course. So if you are an inexperienced player, do not get discouraged by the start of the course - everyone has a hard time. The wildlife at Stafford is plentiful. Deer, geese, rabbits, ground squirrels, wild turkey, egrets, vultures and hawks are all regular residents. One of the best features of the course is that the area for the course is dedicated to disc golf. There are no other hikers, picnickers or other sports going on at the same time - so the entire space is just for disc golf, which is nice. Make sure you spot your discs well. There are a number of areas where the grass can get quite tall, so it's sometimes easy to lose a disc! There is water available in the parking lot and on the walk to the first Tee. It gets hot out there and with all the hills (which are fun to throw DOWN, but a pain to hike up) you get thirsty, so bring water. If you are susceptible to Poison Oak, be careful on holes #2, #5, #6 and #18. There are a few large poison oak bushes on these holes that you want to avoid. Stafford Lake has a lot of 'tar weed'. This is a sticky, gooey plant that will trash your shoes and socks. So don't wear sandals or nice new shoes. Many players wear gators to cover their ankles. From Highway 101, take San Marin Drive exit. Drive West on San Marin Drive for 2.8 miles, past San Marin High School, to Novato Boulevard. Take a Right on Novato Boulevard and go 1.9 miles west, past the Stafford Lake Dam. The entrance to the park is on the left. Take a right and go to the end of the park and follow the signs to the disc golf course. The first tee is about a half mile from the parking lot. Map of the park (for once you get here) is here. For the official hours and fees, go here. Please remember that if you park outside the park, there is a $2 walk-in fee. We know a lot of people don't like this idea but if we don't pay the $2 they will make all of the streetside parking illegal. So if you park outside, please pay the $2. If you can't afford it, skip a beer. Due to the fact that we've had two fires in the past year, the Marin Fire Department is clamping down on the course. If there is another fire the course may be closed forever. PLEASE, PLEASE, PLEASE DO NOT SMOKE !!! If you burn it down we all will lose our favorite course and you will make a lot of people very unhappy. Be cool, don't smoke. The course may now be closed on Red Flag days when the Fire Department determines there is a high fire threat. Please be careful and don't ruin a great thing for everyone. Enjoy yourself, and thank you for supporting the course.